Retaining talented employees over a long period of time has become a bigger challenge for companies over the years, especially with job-hopping millennials constantly looking for change and something more. Given that these are some of the most qualified professionals in their field, millennials or not, employees that stay with a company for an extended time bring value to the surface. The old mentality of not worrying about the well-being of employees is thankfully being left in the dust and now companies are well aware of the advantages of investing in their solid professionals. Powerhouse companies like Facebook, Microsoft and Google have set a good example of how to take care of employees and the benefits are clear. Following suit, more and more companies are integrating plans into their business model exclusively focused on keeping their staff happy. Teamwork is considered one of the most valued skills of a worker and human resources departments are seeking out ways in which they can use this skill to improve conditions and performance of their employees around a common objective: to escape competitive work environments and create collaborative ones where cooperation is the key to success. This is where Team Building activities come in. Using a technique that consists of carrying out a set of activities aimed at strengthening skills such as leadership, problem solving or joint decision-making, the main objectives are to improve the motivation of workers, promote communication and integration, strengthen trust and companionship and ultimately optimize the work environment. These actions are usually recreational in nature, offering entertaining and constructive proposals that connect all members of the company. They include diverse group dynamics, from outdoor activities, leisure meetings and competitive group actions. Among the latter, one of the most popular alternatives is the Escape Room, an activity that has been used in the personal sphere and that is now beginning to be applied in the corporate terrain. The name says it all: “escape from a room.” This is obviously the self-explained goal of these tests, but to overcome the challenge, you must put into practice a series of social skills that allows participants to successfully conclude each of the challenges they face. An Escape Room for companies is designed to be a scenario in which all employees are obliged to come to agreements. Communication is their best tool when facing challenges and, groups have to come to decisions together in order to achieve success. This Team Building activity also seeks to foster another set of values among participants, skills that they will then apply at work, such as teamwork, commitment and creativity. Team Building has also been proven to boost individual motivation levels. When someone is able to overcome a challenge, they are able to see their best self at full potential, and the best way to do this is to face challenges on a regular basis. In order to get out of an Escape Room it is essential to be creative and mentally agile. Decisions must be made quickly and effectively, just like in the day-to-day of many people’s workplace. Escape Rooms, and Team Building activities in general, help participants get to know each other better and shows the different ways each person can approach a situation. This in turn improves further social skills such as empathy and companionship. Additionally, this activity is also useful for the company to get to know its professionals, to see their strengths and weaknesses when facing a challenge. And in fact, it’s encouraged that the leadership teams participate to take everyone out of the work environment and improve the bonds that unite all levels of the company. Up until this point, Escape Room activities have been carried out mainly in physical spaces, both within the company walls and at specific destinations designed specifically for the challenge. But a new trend is evolving and Escape Rooms online are acquiring a major role. This opportunity to create your Team Building activities online eliminates problems that many face such as lack of time, schedule clashes and geographical limitations of workers, especially those who are in different company locations or work remotely. The advance of the digital era has meant that distances are no longer a problem when it comes to carrying out almost any sort of activity. It’s important for HR departments to offer activities in which all parties can participate, and that’s no easy task considering employees are scattered all around, some even in different countries. One the best options in the virtual market for Escape Rooms online happens to have a platform with not just Escape Rooms, but all sorts of Team Building activities for companies. Virtway Events have multiple activities in which employees can participate from any device, mobile phone, tablet or computer, and the only other thing you need is a decent internet connection. Their Escape Room puzzles are trickey and creative, posing different challenges and riddles to successfully get out of a virtual labyrinth. One of the main advantages Virtway Events has over other online Escape Room competitors is that it’s not necessary to use VR glasses… or go anywhere for that matter. 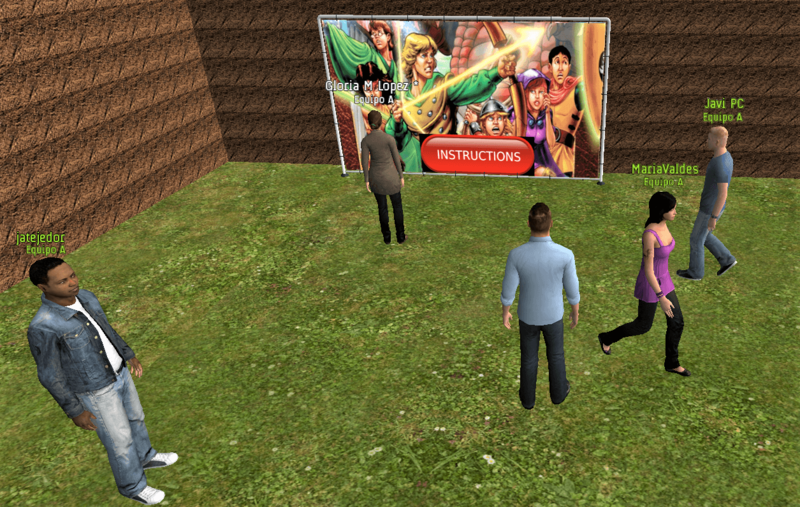 Each participant is represented by an interactive avatar in 3D. This innovative proposal offered by the tech startup has been developed over the years with their own advanced 3D technologies that simulate real experiences in a virtual world. Virtway Events makes it possible for participants to experiment with totally immersive virtual environments. Each one of the avatars imitates the players of the Escape Room (or any other virtual world) in a very lifelike way, even mimicking physical aspects of each person, and recreate a scenario in which they can interact and communicate, maintaining real conversations through voice over IP in a natural way. The benefits of virtual Escapes Rooms online are evident and can play a fundamental role in Team Building activities. They enhance creativity and mental agility, reduce stress and optimise teamwork. So, what are you waiting for?! Get your company signed up ASAP for an hour or so of virtual Escape Room fun!